Simply put, this the plan. Net Neutrality - is dead. Regulations and consumer protections - dead. Mergers - Scream, then accept them with no serious conditions. Rural broadband - Shut off the wires. These people chose to live in the woods. Competition - Kill off whatever is left standing. Government protecting the large companies -You bet. Price increases, leveling off of speed increases, less privacy, more tracking - on all services. Government grants, subsidies - 'They are so 20th Century', (except where our friends need it). Reverse as many decisions created under the Wheeler FCC as possible. Shrink the FCC and neuter it. President-elect Donald Trump claims that he is going to 'drain the swamp' of 'special interests'. The following is actually the last item on a shopping list of what President-elect will do in his first 100 days. "Clean up Corruption in Washington Act. Enacts new ethics reforms to Drain the Swamp and reduce the corrupting influence of special interests on our politics." "Trump Campaigned Against Lobbyists, but Now They're on His Transition Team. "President-elect Donald J. Trump, who campaigned against the corrupt power of special interests, is filling his transition team with some of the very sort of people who he has complained have too much clout in Washington: corporate consultants and lobbyists." He is formerly the founder of a coin-operated group called Progress & Freedom Foundation (PFF), and is now a visiting scholar at AEI as well as working for the telco-friendly, NERA Economic Consulting as Managing Director Co-Chair, Communications, Media, and Internet Practice. But, as the Times wrote, he also works for Verizon, yet is the head of the transition team to fill the FCC with new staff. "Jeffrey Eisenach, a consultant who has worked for years on behalf of Verizon and other telecommunications clients, is the head of the team that is helping to pick staff members at the Federal Communications Commission." If Trump is serious about 'draining the swamp', then he should worry he is instead creating a new toxic garbage dump, filling it with the same bad actors he claims he wants to clean out. Over a decade ago, 2006, Common Cause wrote a report on telecom front groups and 'think tanks'. "Another industry approach is to fund "think tanks' and nonprofit groups with innocuous sounding names to write reports and policy papers. These groups accept subsidies or grants from corporate interests to lobby or produce research when they normally might not, but too often fail to disclose the connection between their policy positions and their bank accounts. "These sorts of campaigns are dangerous for our democracy. They deliberately mislead citizens and they deliberately mislead our lawmakers, who are already charged with the difficult task of making sense of complex telecommunications policies." And in the center of this was Eisenach's Progress and Freedom Foundation, who had most of the large phone and cable companies as their clients. "The Progress and Freedom Foundation's list of corporate donors reads like a who's who list of the telecommunications industry. Telephone companies like AT&T, BellSouth, and Verizon; technology companies like Microsoft and Intel; telecom trade associations like the National Cable & Telecommunications Association and the Entertainment Software Association; cable companies like Comcast and Time Warner; cell phone companies like T-Mobile and Sprint; and broadcasters like Clear Channel Communications and Viacom have all helped fill PFF's coffers to the tune of a $3 million per year operating budget." And thanks to the Wayback machine we found a list of PFF 'contributors', (1999) which represented almost all of the largest phone and cable companies, as well as their associations/lobbying groups. Here's an excerpt. Ironically, by 2007, most of the phone companies would merge into just AT&T and Verizon. And if you want a sense of just how long many of us have been dealing with various astroturf groups and coin-operated stink tanks, the decade-old Common Cause report points to two current issues that will be up for grabs under the Trump FCC--ala carte pricing (and now set top boxes) and net neutrality. PFF closed in October 2010. What Will the FCC Look Like? We know what a Republican-based FCC is going to be like because PFF and Eisenach were on the transition team for the former FCC Chairman, Michael Powell takeover in 2001. Powell is now the CEO of the cable association, the NCTA. "PFF President Jeff Eisenach and Director of Communications Policy Studies Randolph J. May have both been named to the Federal Communications Commission Advisory Committee for the Bush-Cheney Transition. "As members of the advisory committee, Eisenach and May will provide input on policy and institutional issues facing the Commission. Both Eisenach and May have written extensively on communications policy issues. On December 8, the Foundation released their co-edited book on FCC reform, "Communications Deregulation and FCC Reform: What Comes Next?" More recently, in 2014, Eisenach testified that net neutrality is bad for 'consumer welfare' among other harms. "My testimony today advances three main points. First, net neutrality regulation cannot be justified on grounds of enhancing consumer welfare or protecting the public interest. Rather, it is best understood as an effort by one set of private interests to enrich itself by using the power of the state to obtain free services from another - a classic example of what economists term "rent seeking." Second, the potential costs of net neutrality regulation are both sweeping and severe, and extend far beyond a simple transfer of wealth from one group to another. Third, legitimate policy concerns about the potential use of market power to disadvantage rivals or harm consumers can best be addressed through existing antitrust and consumer protection laws and regulations. "To begin, net neutrality regulation cannot be justified as a means of enhancing consumer welfare or advancing or protecting the public interest, and instead is best understood as a classic example of rent seeking. This is particularly true of the more extreme flavors of net neutrality regulation advanced by companies like Netflix, which would ban payments from companies like Netflix to Internet Service Providers (ISPs) like AT&T." 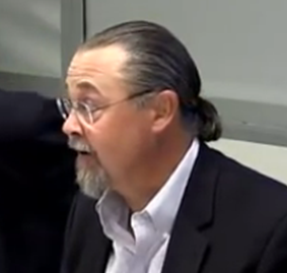 In 2015, Eisenach, as part of NERA, (and funded by Facebook's Internet.org) concludes that Zero Rating, which is to not charge a wireless customer for the time they are using the service for downloading specific content, is OK.
"Dr. Eisenach concludes that Zero Rating programs in general represent an economically efficient mechanism for increasing consumer welfare given the unique characteristics of information technology markets, which make it beneficial to offer lower prices and other incentives to expand the size of the market, especially in developing countries where incomes, and market penetration, are low. He argues that, with respect to diversity of expression and related concerns, it is difficult to construct a scenario under which increasing access to online information and adoption of digital communications services would be harmful to online speech. While regulatory authorities should remain vigilant in monitoring business practices, broad-based bans or restrictions on Zero Rating plans are far more likely to harm consumer welfare than improve it." And, in 2013, Eisenach presented this slide at an Internet Society event. His major point: we don't need government regulation or intervention on anything. And, we don't really need competition, lower prices and let's make sure that the profits to the companies are obscenely profitable--as a consumer welfare issue. NOTE: During the writing of this article I came across a collection of documents, articles and emails about Eisenach. "Paid by Verizon to Intervene on Net Neutrality With the F.C.C. "Mr. Eisenach led an effort to write to the chairman of the F.C.C. in opposition to proposed internet regulations. 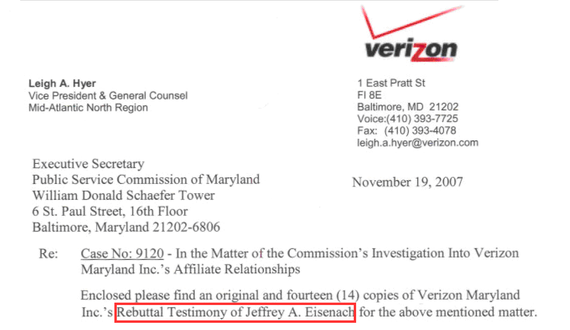 In this letter, he disclosed his role as a Verizon consultant." 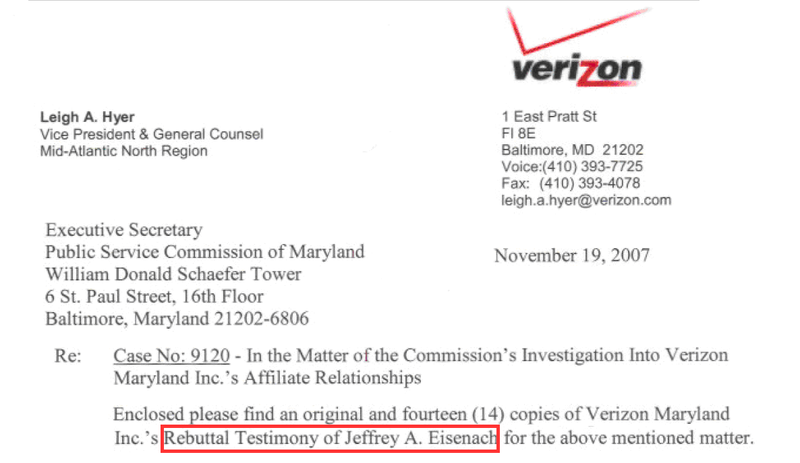 "Verizon is the company that appears most often in these disclosures. The work includes a 2013 regulatory submission for the company and a 2010 challenge to an F.C.C. plan to force telecommunications providers to open their networks to competitors. Here are excerpts. Verizon declined to comment. " The opening list is a warning of what to expect. If Trump cares about draining the 'Special Interest Swamp', then having a coin-operated analyst, (with a skew towards his clients), leading the FCC's transition, is just wrong. It will be seen for what it is -- just dumping more pollution into the swamp that needs a good cleaning.